Hitty (short for Mehitabel) is a tiny wooden doll found by author Rachel Field in a New York City antique shop in the winter of 1927. 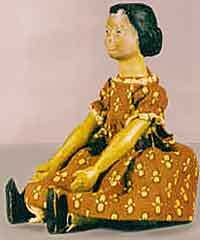 The original Hitty doll was carved from mountain ash wood, about 6½ inches tall, with pegged arms and legs, each pair moving together. The exceptionally-personable doll inspired author Rachel Field and illustrator Dorothy Lathrop to create the Newbery award-winning children’s book, Hitty, Her First Hundred Years. Since its release in 1929, the book has charmed generations of Hitty lovers. 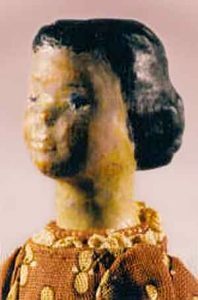 They admire Hitty’s calm, indomitable spirit as she meets and overcomes many setbacks and adventures, from the time she was first carved by the old Irish peddler in the Preble house, around 1827, until she was finally resigned to the New York City antique shop, to be found by Field.